If you’ve been to the big name tourist destinations south of the US border, it’s time to discover Belize. 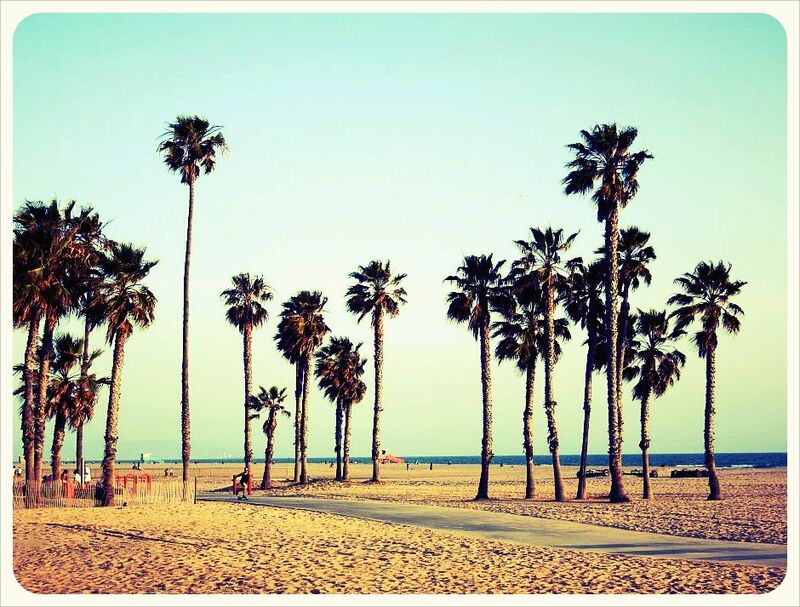 Hmmm… heard the name but aren’t sure where it is? Well, it’s in the northeast corner of Central America, tucked right under Mexico and east of Guatemala, with 240 miles of gorgeous coastline on the Caribbean. It’s been nearly 40 years since the former British Honduras gained its independence, but – bonus! — English is still the official language. As part of the Mesoamerican biodiversity hotspot, Belize has jungles, wildlife reserves, and vast forests of old-growth hardwoods. With the lowest population density in Central America and most of its land undeveloped, it’s wild enough to be fascinating and tame enough to be welcoming. Whether you’re down for a tropical escape from winter weather or up for some serious adventuring, you’ll find it in Belize. Tropical breezes, lilting accents, and music ranging from the African-inspired sounds of Punta to the calypso beat of the Belizean Kriol’s Brukdown and the transporting ancient melodies of Maya music played on marimbas. What more could you want from a Caribbean vacation that takes you away from the day to day grind? You can start your trip with an easy packing job, too, because the weather is always warm, yet comfortable, at a yearly average of 84◦ F, and while the tropics are notably humid, February through May is Belize’s dry season, with only occasional, short and mild bursts of rain. 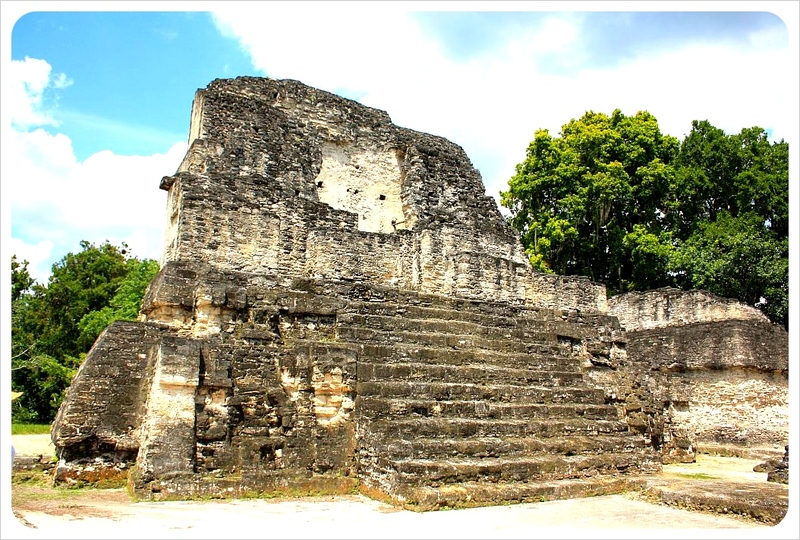 The Mayas about 3500 years ago were the first people to establish settlements in Belize. Christopher Columbus and his crew in 1502 were the first Europeans to arrive on its shores, but the Spanish conquistadors bypassed it, and it wasn’t until more than one hundred years later that the British founded a settlement there and later made it a crown colony. In today’s Belize, traditions and customs are rich and varied, representing the cultures of the original Maya, as well as Mestizo, Kriol, Garifuna descendants of the African immigrants, and more recent East Indian, Mennonite, Arab, and Chinese arrivals who have added to the friendly and diverse mix. While it’s the only English-speaking country in Central America, you’ll also hear Kriol, Spanish, and a number of unique Maya and regional dialects. Belizean food reflects its cultural diversity as well. Rice and beans cooked in coconut milk is pretty much the national dish, served with beef, chicken, pork, fish, lobster, or shrimp. You’ll also find delicious ceviche, tamales, slow-roasted pork known as Cochinita Pibil, Johnny cakes, and the savory soup called Escabeche. Ice creams made from native fruit will make you forget your diet entirely. It’s no surprise that there are many wonderful beaches along Belize’s long coast. Among the most fun is Placencia, Belize, with a lively nightlife, beachfront reggae bars serving potent cashew wine and ice cold indigenous Belikin beer, plus shops offering a wide variety of native crafts and works of art. Beach cruisers and golf carts are the way to get around, and you can spend your days relaxing on the sand or playing beach volleyball, kite surfing, paddle boarding, snorkeling, diving, or heading out for deep sea fishing. You can also take a kayak through the lagoon where crocodiles, amazing birds, and exotic animals live among the dense thickets of mangrove trees. The Belize Barrier Reef spans 185 miles of the country’s coastline and is the largest and most intact reef system in the Northern Hemisphere. It comprises seven marine reserves, over 400 cayes or islands, and three atolls, with crystalline blue waters and over five hundred species of fish swimming within its over one hundred varieties of coral. It has been named a UNESCO World Heritage Site for its significant habitats and natural development, and is a paradise for snorkeling and scuba diving. To head off the beaten path and see the rainforest up close is an experience not to be missed, particularly in that ecosystem’s current endangered state around the world. The southernmost half of Belize is covered by dense jungle, much of it unexplored and under government protection to preserve the habitats of the jaguars, pumas, ocelots, tapirs, howler monkeys, and other creatures who make it their home. Over 500 species of birds soar through the vines and you can catch sight of Belize’s national bird, the fruit-loop keel-billed toucan, as well as neon-green-painted parrots, rare agami herons, macaws, snowy egrets, and jabiru storks, the largest flying bird in the Americas. You’ll also be delighted by the rainforest’s 4,000 species of tropical flowers, including 250 varieties of exquisite orchids. 1. 174 miles of beautiful coastline – Belize might be small, but the entire eastern side borders the Caribbean Sea, with many white sand beaches and turquoise waters. 2. Banana Bread – the supersoft Belizean banana bread is unrivaled, especially when it comes fresh out of the oven. 3. The amazing caves in Western Belize: Both Barton Creek and Actun Tunichil Muknal are home to amazing rock formations, floor to ceiling stalagtites & stalagmites, and fascinating Maya artefacts. 4. The cultural mix – we were surprised by the peaceful mingling of Latinos, the Garifuna, Mestizos, Maya and Mennonites. 5. The beautiful, undiscovered nature – Traveling through Belize, you see green everywhere: woods, fields, meadows, and much of it still seems so untouched. 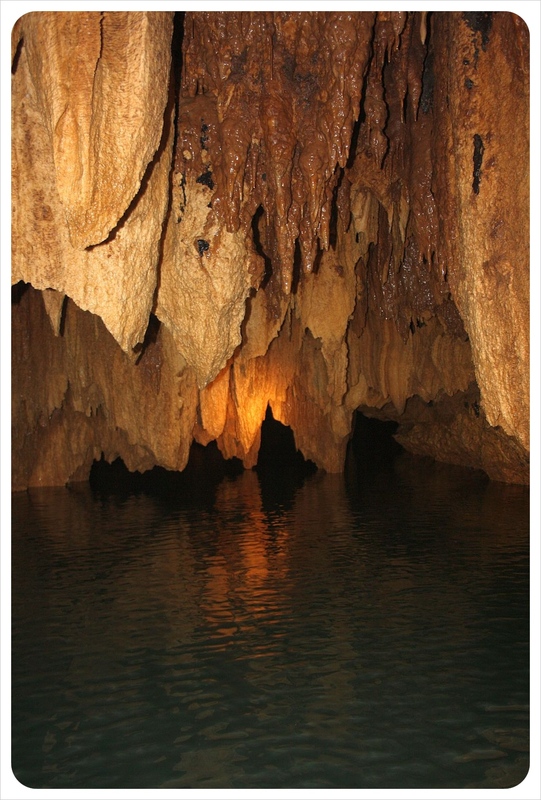 Many of the caves and Maya sites have only recently been found. 6. Belikin Beer, enjoyed ice cold. 7. 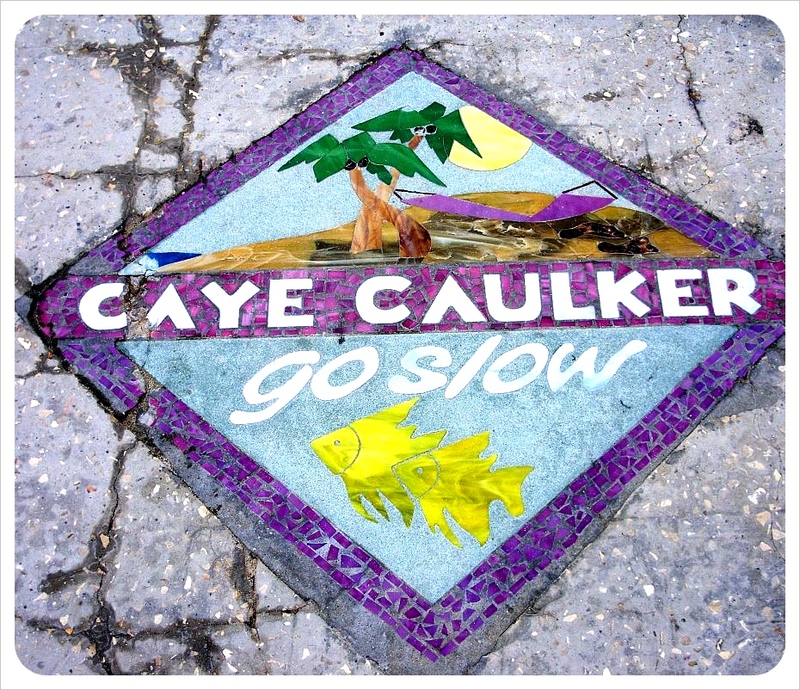 The laid-back lifestyle on the Cayes – ‘Go slow’ is the motto of Caye Caulker, and that is exactly how life is lived. Stay away from the Cayes if you’re in a rush, because nobody else is (including service staff at bars and hotels). 8. The ‘small town feel’ to the country – Everyone will stop for a friendly chat, and within days, you already feel at home. With a population of 300,000, Belize is small not only in size, but also in population. It is likely to run in to locals you meet in one place while exploring somewhere else way across country. 9. Swimming with sting rays, nurse sharks, turtles, barracudas, and tons of other fish on the Meso-american reef (plus the beautiful corals). 10. 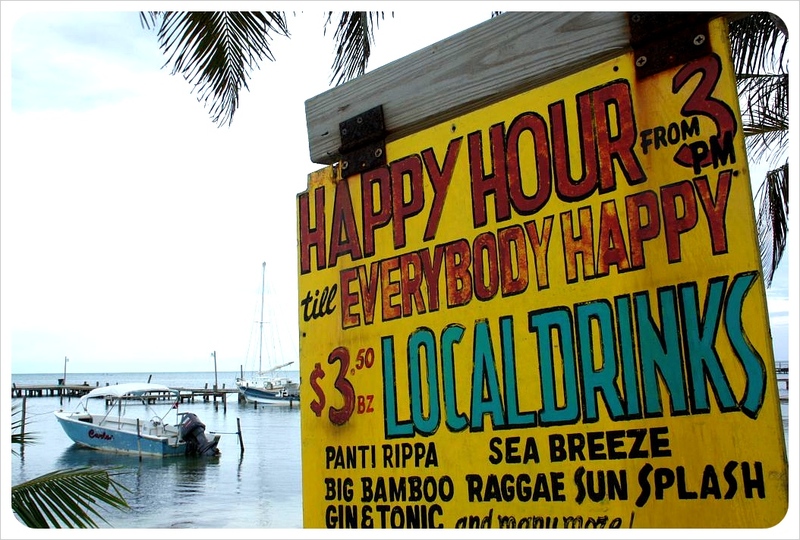 The ‘swing bars’ on Caye Caulker make even the longest term travelers feel on holiday. 11. The diversity of the country: from tiny islands, subtropical woods, mountainous rain forests, fruit orchards, cattle meadows, caves and waterfalls – all filled with abundant wildlife. Have you been to Belize? There are still plenty of places we have left to visit in Belize, so please feel free to join in and share the things you love about Belize in the comments below. Although technically a part of Central America, a trip to Belize, with its white sand beaches and English-speaking Rasta culture, is decidedly Caribbean. 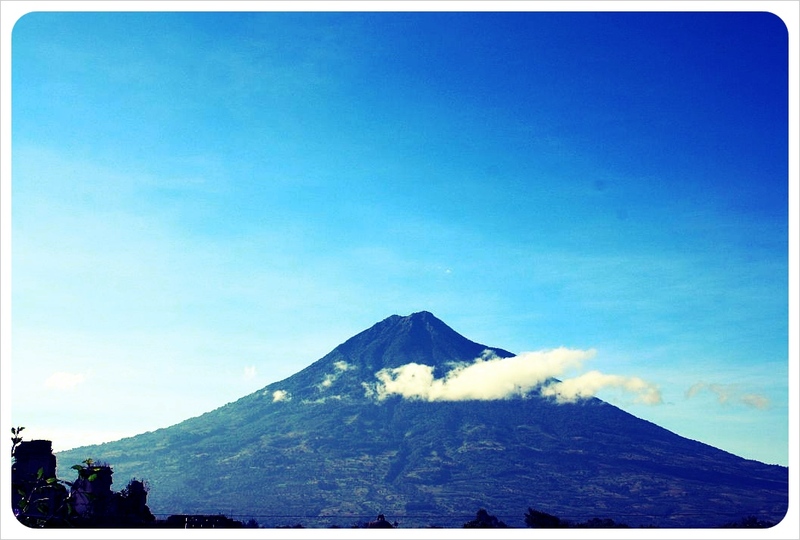 A trip here is more similar to Jamaica holidays or Caribbean vacations than to its neighboring Guatemala. The clear blue sea and laid-back culture makes Belize a top travel destination, it also means it is much more expensive than elsewhere in Central America. Even as an experienced budget traveler, more money will fly out of your hands in Belize than anywhere else in Central America or Mexico. Snorkeling costs at least $40, diving gear runs $100 for a day out on the world’s second largest reef and any tour will vary from $40-80: adventure cave tours, tours of Mennonite villages, nighttime jungle tours. You need to book a tour, however, as access to all of these amazing opportunities in Belize can not be done without a guide – but if you go to Belize, you must take part in at least a couple of these tour. Skimping on these high-expense activities means factoring out the adventure and amazing natural and cultural experiences unique to Belize. What would be the point in traveling to Belize at all? 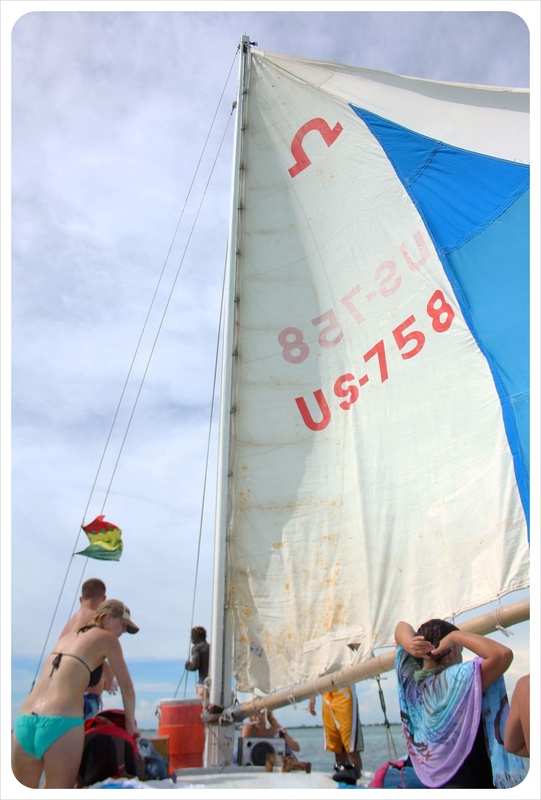 Instead, it is best to know beforehand the best ways to reduce expenses in other areas in order to maximize fun and, with careful planning, stay within your budget in Belize. But, doesn’t low season sometimes mean rainy season? 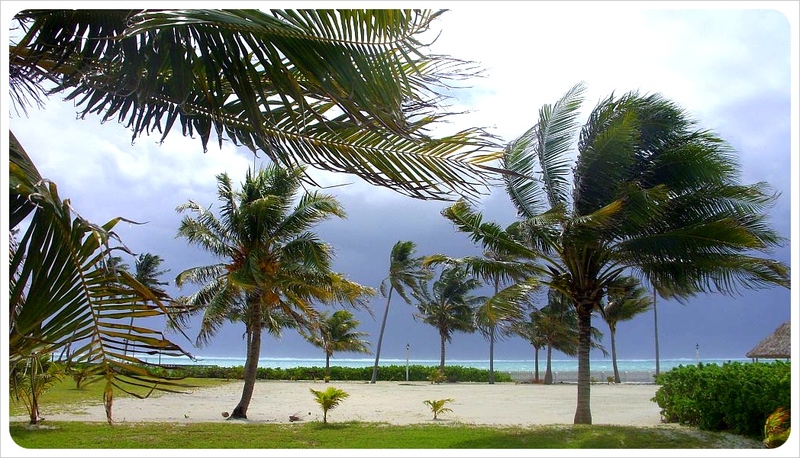 Yes, in fact, it was hurricane season when we visited Belize and we did indeed get stuck on Ambergris Caye as the locals boarded up windows in preparation for a tropical storm that never came. While it might rain for part of your time if you travel during the fall, the financial benefits outweigh a few rainy days – and we were able to take part in all the activities we had planned anyway. In the low season (Spring or Fall), prices are negotiable. In the Summer or Winter, they are not. 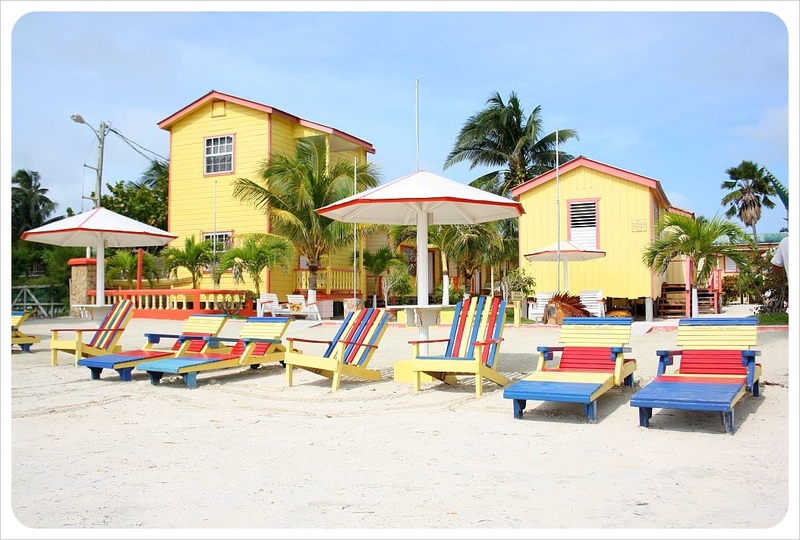 We got two deals for hotels on Caye Caulker: at Jeremiah’s Inn we paid US$15.00 including tax (normally US$30.00 plus 9% tax) and at the Barefoot Caribe Hotel we paid US$25.00 for a double room instead of US$35.00. 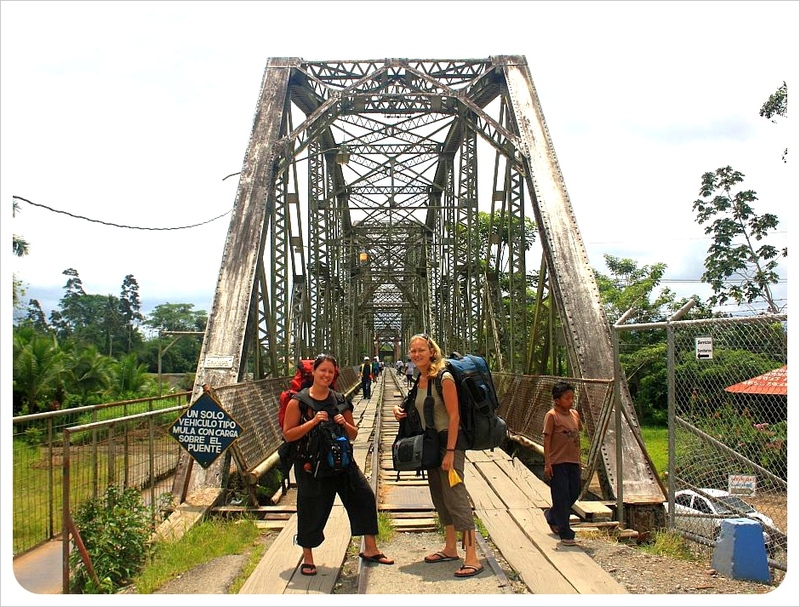 In San Ignacio, at Mayawalk tours, we were able to reduce our ATM tour rate from $75 to $65 each. Toiletries are expensive in Belize. 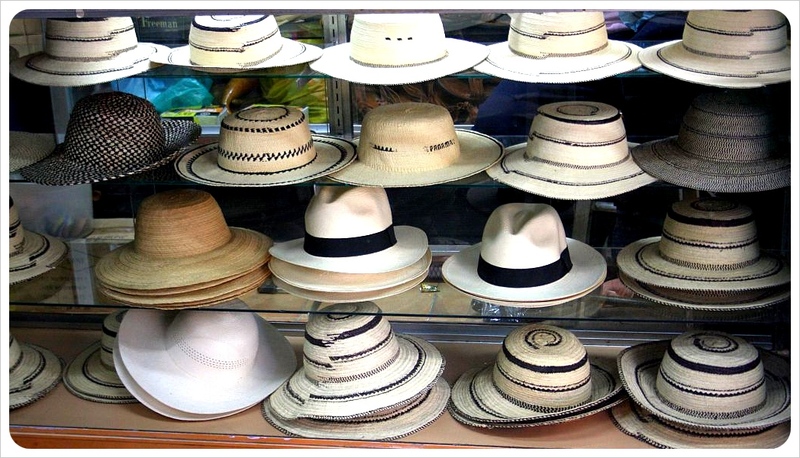 If you are taking a vacation to Belize, buy everything at home before you go. 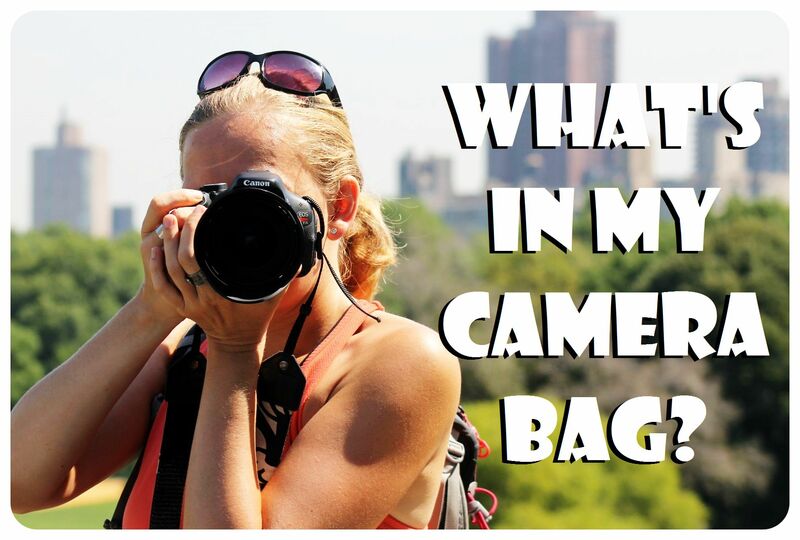 If you are a backpacker or digital nomad, get your supplies in whatever country you are coming from. You will need to get a nice big can of insect repellent and sunblock – in Belize these cost us $15 and $19 respectively, while in neighboring Guatemala the same exact products would have cost us $6 and $7. Not having to buy essential toiletries in Belize will save loads of money. The reason why we found eating in Belize more expensive than in neighboring countries is that we did not find as many street food stalls or sandwich places as usual, and supermarkets within walking distance of hotels are anything but super, with half empty shelves and products like Pop Tarts and Kellogs Rice Crispies, but no fresh fruit or fresh orange juice, for example. As hostals are also hard to come by, preparing your own food is not often an option. 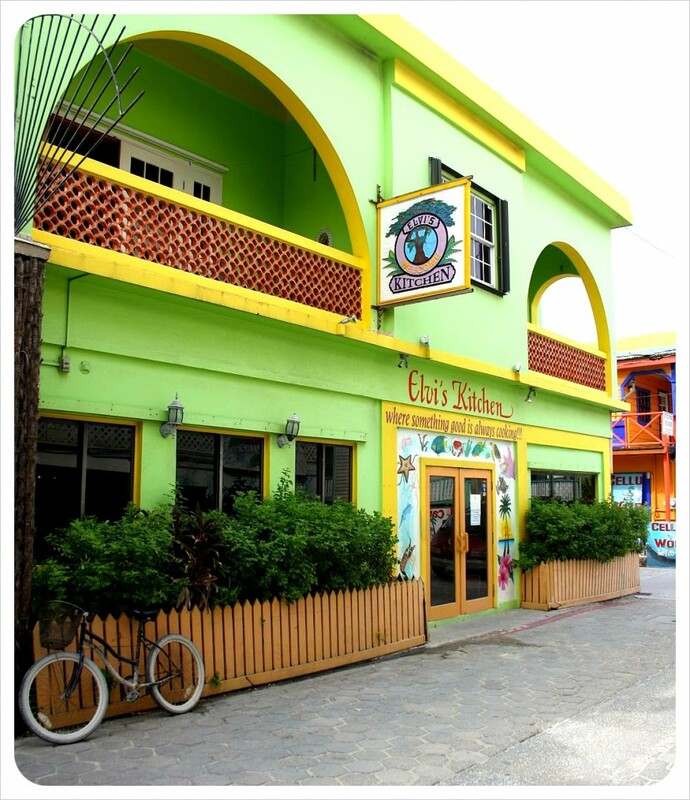 Caye Caulker has one hostel, Yuma’s House, which has a kitchen. Otherwise, most nights will be spent in hotel rooms with no cooking facilities. There are plenty of cheap restaurants – just make sure to hunt for them. We had Indian in San Ignacio for under $10 for the two of us leaving stuffed, on Ambergris Caye we recommend the Latitudes Café for cheap breakfast and Ruby’s Cafe for giant, cheap, strong coffee. If you like fried chicken, you can get a takeaway almost anywhere in Belize for cheap. Note: The Cayes are more expensive than mainland Belize. The public transportation system in Belize consists of the same 20 year old ‘retired’ North American school buses crammed with twice as many grown adults as the number of pint-sized school children they were meant to hold. Not the glamorous way to go, but certainly cheap and efficient. Distances are short in Belize, where a ride east to west cross country lasts only three hours, so don’t waste money on private shuttles or taxis, they charge up to ten times the price of the bus and get you there no more quickly. Tickets are cheap and the ride is most definitely entertaining – buy yourself a bottle of all-healing home-made seaweed milk, a ham and cheese sandwich and the newspaper from the vendors who board the bus, and you’re set for the trip! Belize has only very few hostels, and many more guesthouses and hotels, where a double room is no more expensive than a private room in a hostel. The cheapest accommodation was a hostel we found on Caye Caulker – Yuma’s House (formerly Tina’s Backpackers) with $12 in a dorm. Caye Caulker is the backpacker island, it is smaller, more relaxed and there are several budget hotels of similar quality for around $25-$35 a night (two people sharing). The only hostel-like place on Ambergris Caye is Pedro’s Inn, outside of San Pedro, where a double room costs $25. We did stay here, and the room was the smallest we have ever stayed in, plus we left a bit itchy. Much better was Ruby’s, right in town and by the beach, for the same price, with a private bathroom included. 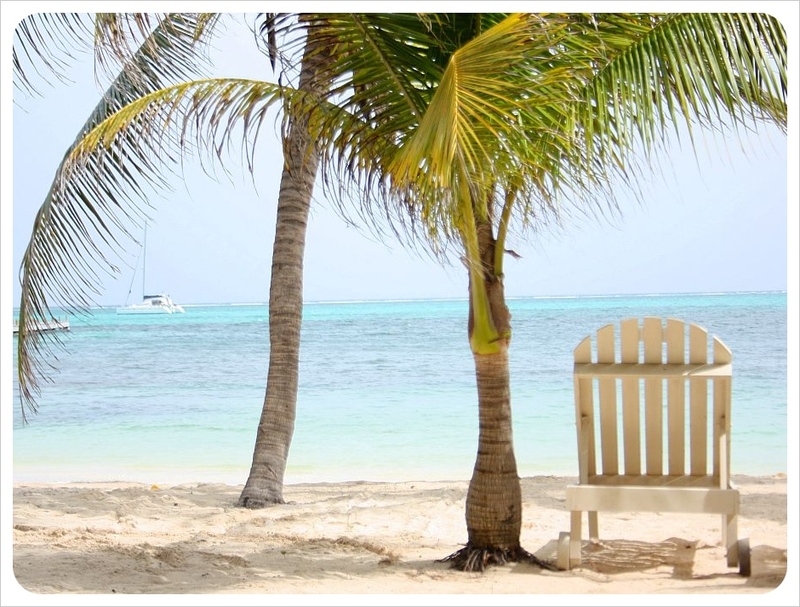 Research well before booking on Ambergris Caye as it can be pricey. On the mainland in any major town or tourist hub, you will find several budget guesthouses that charge around $20 for a double room, but be careful as quality definitely varies. With Reggae music blaring, hammocks swinging and crystal blue water surrounding you, no doubt you will be in the mood for some drinks while in Belize. Even for long-term travelers, something about traveling in the Caribbean makes you feel like you are on ‘vacation’. Unfortunately, drinking can be very costly, much more so than in the rest of Central America, with a small beer costing up to $3 even at a local dive. But don’t worry – go to Happy Hour. Most bars have 2 for 1 drinks and some even have all you can drink for $20. 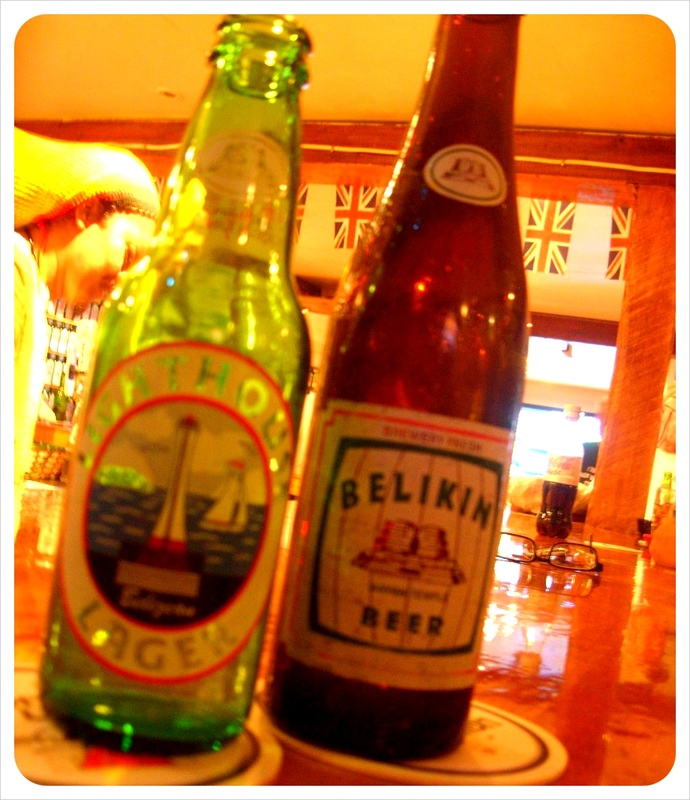 You can also save money by sticking to Belikin beer (made in Belize) and local drinks such as rum punch, which usually costs around $1.50 and does the job quite nicely. 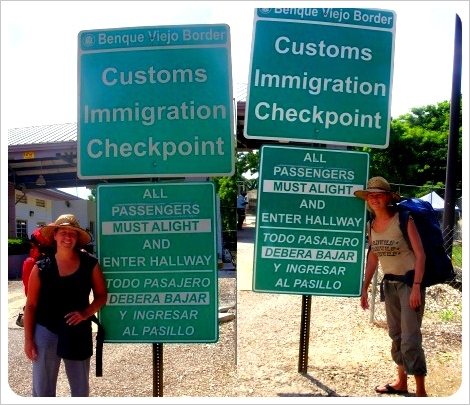 However you choose to cut your costs – cheaper accommodation, less drinking, and/or opting for public transportation, a trip to Belize requires more careful planning and shopping around with various tour companies than neighboring countries where a few extra Quetzales or Pesos won’t dent your budget the same way several dollars each time will in Belize. 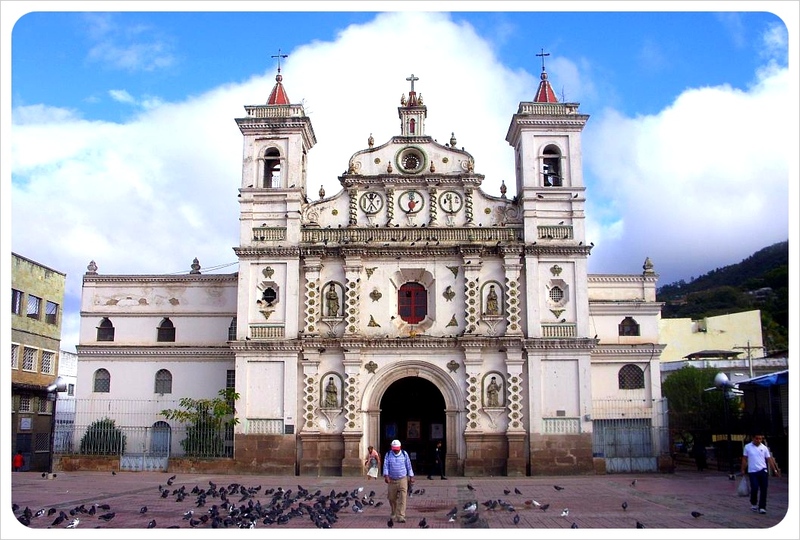 In San Ignacio, we chose Mayawalk tour agency for our ATM tour, whose original rate (pre low season discount) was $75, whereas a few of the other agencies wanted $90 per person for the same exact tour. Lower prices is one important reason to do your research, and another is to maximize value for money. On Caye Caulker, most tour agencies will do a full day snorkeling tour for $40, but shop around and see what you get for that price. 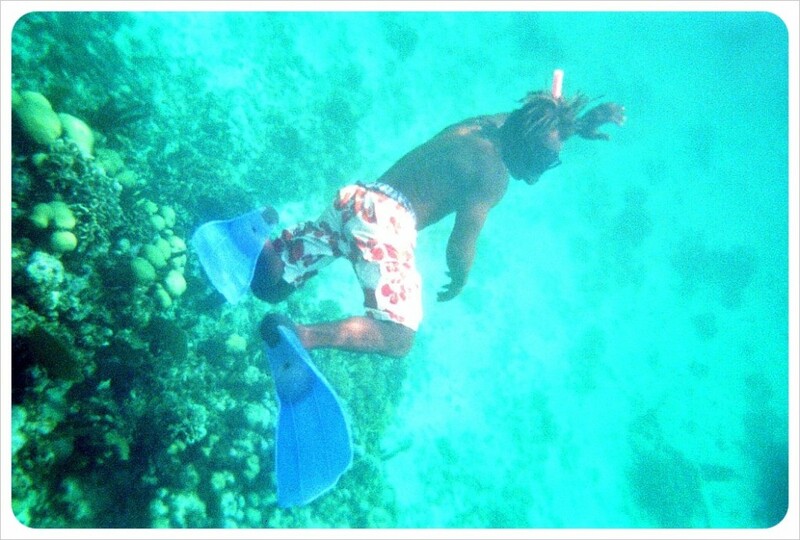 Some companies do exactly what it says on the box – take you to three snorkeling locations and provide a soggy lunch. With Harry and Steve of Blackhawk tours, for the same price we got an excellent guide (Harry) who took us to three locations, Steve made us lunch, snacks, gave us water, plus bottomless cups of rum punch, nachos and homemade salsa and ceviche (made on the boat that day) for our hour long trip back to the dock. 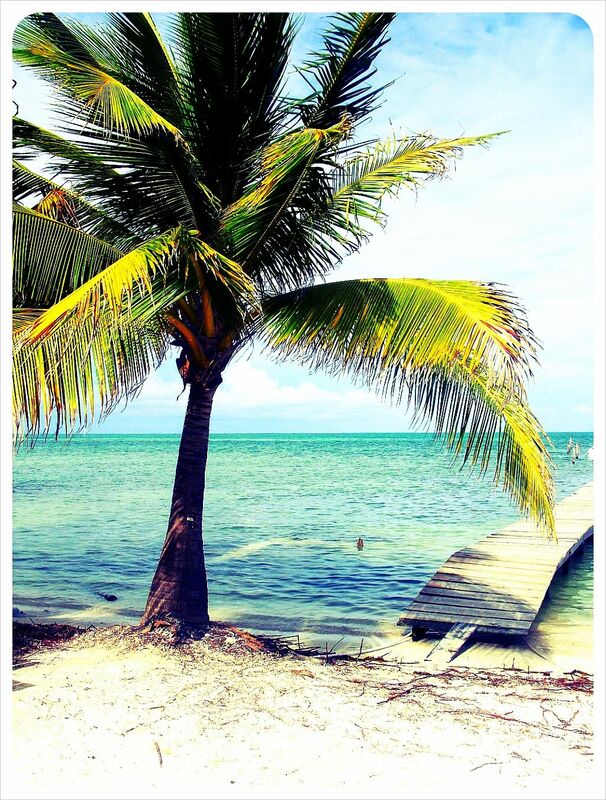 Have you been to Belize? If you know any bargains or cheap places to stay, please share them in the comments below. Prices in this article are quoted in US Dollars. It is amazing how much life you can squeeze into 100 days. It seems like forever ago that we wrote our first 100 days on the road post from Mazunte, on the Pacific coast of Mexico. Between then and where we are now, in San Salvador, we have visited four countries, explored caves with Mayan skeletons, climbed volcanoes, swam with sharks and sting rays in the Caribbean, lived for a month in a beach front apartment in Playa del Carmen, had two fairly major illnesses, almost got robbed, traveled to places almost completely off the beaten path, met loads of people, worked full time, even took on extra work, blogged more, and we are nearly finished with a globetrottergirls.com website redesign. In short, during our second 100 days, we have really gotten the hang of long-term travel. Balancing full-time work and full-time travel has gotten much easier, and it no longer feels as though we are ‘squeezing in’ time for the blog, either. Life on the road is certainly more spontaneous than stationary office life, but habits develop and life inevitably takes on a new, but distinct rhythm. What may have initially felt exotic is now second nature – chicken bus trips flinging us faster than roller coaster rides, hopping in and out of tuk tuks, bellying up to market stalls to wolf down street food, and even things like negotiating prices and striking up conversations with complete strangers now come with ease. While some things have gotten easier, there have been some definite lows: Dengue, Giardia, bed bugs, serving as a mosquito buffet, and the typical bouts of some painful stomach cramps. In addition to interrupted good health, our work/travel pace has also been severely interrupted at times. A trip to Todos Santos and Chichicastenango in Guatemala and a hectic week in El Salvador kept us offline a lot recently, and we have had to make up for a lot of lost time. During these offline times, it has become clear that the longer you travel and fall in love with exploring, the more you tend to fall off the beaten path, which means invariably means away from quality internet connections. This is fine for the mind-blowing life experiences column, but makes managing priorities a challenge, walking a fine line between staying planted online along the beaten path which ensures a much easier time of balancing work and travel, but strictly following the ‘Gringo Trail’ can be less than fulfilling for the explorers in us, even if it satisfies the worker inside. Our time in Antigua has also come and gone – a milestone of sorts for us. I lived in the colonial ex-capital for two years from 2001-2003, and since we met in 2006, I had constantly told Dani stories and even introduced her to some of the crazy characters from my time there. Finally after four years together and over five months on the road, we arrived in Antigua, staying for two weeks. We worked, I overcame the rest of my Dengue, we ate out (a lot! ), and we basically recuperated and prepared for the heavy weeks of constant movement to come. It was amazing to have Dani explore with me not only the town, but this part of my path that may have always just been stories, had we never set off on this trip. Two weeks was a great amount of time to rest in Antigua, but we spent even more time, an entire month, in a great apartment just two minutes from a nearly deserted section of Caribbean beach in Playa del Carmen. 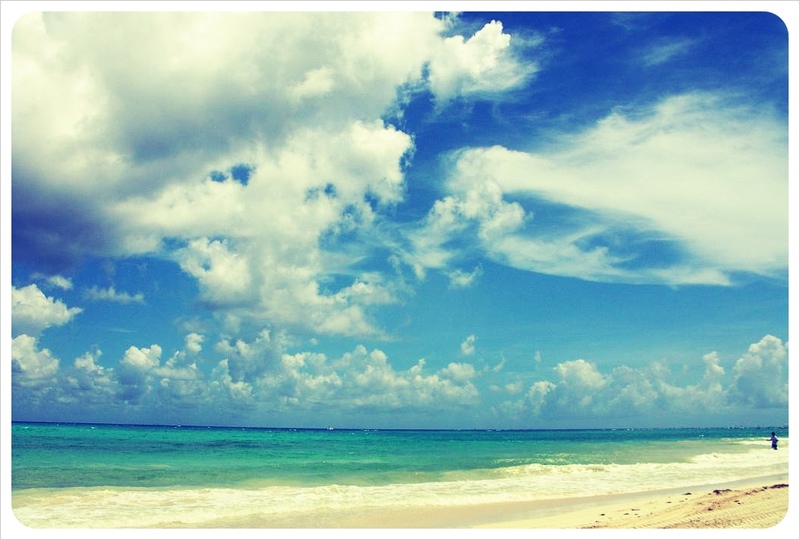 Here we worked intensely full-time, both of us, using the beach as the ultimate lunch break. Thinking back to the days of grabbing a sandwich and running an errand before stuffing ourselves back in the office in London, we appreciated every moment we had on the beach in Playa. The Playa del Carmen segment of these last 100 days extended the Mexico leg of the trip even longer. After nearly three months, we semi-grudgingly cut off our time in Mexico toward the end of September, forcing ourselves to head on to Belize. 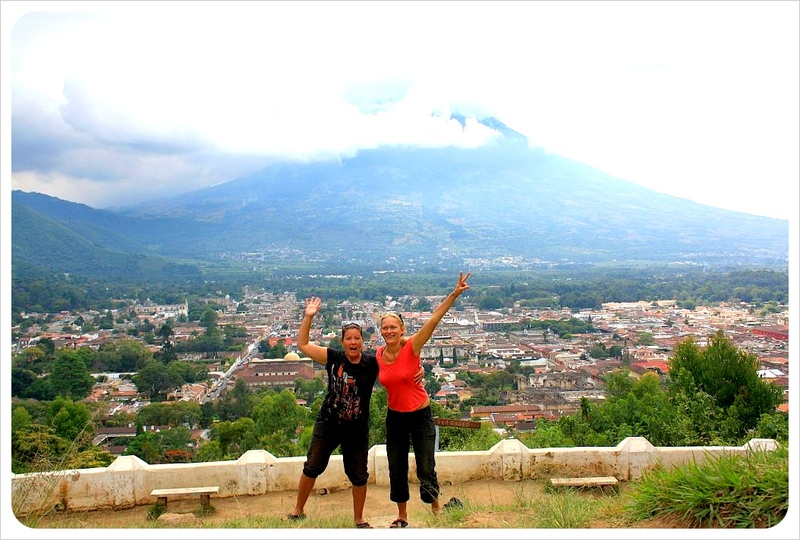 Of course, we ended up loving Belize, and Guatemala and El Salvador, too. During the former Reflections post one hundred days ago, we remarked that people, at least so far, are inherently good. Having now traveled to more countries, cities and smaller villages, our faith in people deepens, even despite an attempted robbery on my bag in a bus from Antigua to Chimaltenango (she razored the side, but didn’t get anything). Our enthusiasm for the people of Mexico (friendliest people on the planet) still stands, but we have been met with kindness, helpfulness and new friendships in each of the places we have visited. One downside to our trip has been the fact that we eat out. A lot. We are tired of eating out in restaurants, and wish it were easier cook for ourselves. The food usually ranges from edible to delicious, but the waiting, the ordering, the clarifying what it means to be vegetarian (it has chicken, is that okay? No? Well, we have a lovely fish dish you might like to try….nothing with a face, you say? )…these things are time-consuming and complicated. Cooking for ourselves more often would be great, but only comes with our apartment rental and housesitting gigs, as the minority of hostels we stay at offers a guest kitchen. But listen to us, complaining about the luxury of eating in restaurants, or eating at all. How ridiculous, considering the level of poverty we see as we move southward through Central America. It is not only the poverty, but the sharply defined divide between rich and poor. It is so absurd to see a shoeless man, whose feet are both black from dirt and bloody scamper quickly past an exclusive Nine West luxury shoe boutique in San Salvador to avoid bumping into an elegant middle-aged woman as she steps out of her Lexus SUV to purchase yet another pair of $200 shoes. With each day our awareness of poverty increases, as we see human beings fighting for their lives as a result of the most basic illnesses and it breaks our hearts. Just as heartbreaking for us are the terrible conditions of the thousands of street dogs running rampant through these countries. For any of you who can watch a film with murders without flinching but turn down the volume and cover your eyes when a dog dies in a film – you will understand how we feel here. For every dog treated as one of the family, there are one hundred street dogs treated like rats. People shoosh them away and even throw shoes at them to force them away. All breeds of dog, from tiny Chihuahuas and West Highland Terriers to Rottweilers, Collies and an amazing range of mutts, are bone-thin, starving, constantly scavenging, nose in any heap of garbage to lap up the remaining crumbs. Their skin is often open, bleeding, gouged from dog fights, or worse, the wrath of remorseless teenage boys. We have seen several dogs lying on the side of the road or in a park, breathing shallow sips of air in what are most certainly their last few breaths. In Quiche, near Chichi, I am sure that one of the dogs, had we gone back just an hour later, would most certainly be dead. But who to help first? How to start? This is where we are at now, and each and every day we see another dog, man, kitten, child, woman that we would like to help. And although we considered it, we can’t buy everyone their own pair of shoes or take in all of the stray dogs. Even though we have recently decided to kick up our travels into a higher gear to make it to South America hopefully by January / February, don’t be surprised if we stop along the way to volunteer, and any recommendations for volunteering with children in Honduras/Nicaragua/Costa Rica/Panama are happily accepted in the comments below. Lastly, in these last 100 days, as our site has grown and filled with content, we have decided to take globetrottergirls.com to the next level. We need a fresh design to display much more content at once, rather than the straight chronological blogging format. Some kinks and links might still need adjusting, but we would love to hear comments on the new look and feel of globetrottergirls.com. We also finally have a subscription box, so please please please feel free to sign up to receive email updates with new posts as they are published. October 30th marked our 6-month travel anniversary, and while we’re sharing our Travel Tops and Flops and reflection on ‘200 Days on the Road’ on our 200-days travel anniversary on 15 November, the six-month marker seemed the right time to take a look at our expenses so far – including how much we have spent, where the money went, and what our average per day spend has been in each country. Luckily, Dani keeps a very exact expenses sheet calculating our outgoings to the last centavo, with up-to-date exchange rates telling us each day just how much every hotel room, bus ride, and ice cream cone costs in British Pounds (the currency we earn), US Dollars and the local currency. Please note: Our daily spendings are meant to be used as a guide for future travelers, or as a comparison for those of you currently on the road. However, as we work while we travel, we are not stuck to a fixed budget which we will one day deplete. We might spend a little bit more than the average backpacker, but we are guessing that our expenses are quite average for digital nomads in Latin America. When we left London for Las Vegas on 30 April, we had no idea how expensive the U.S. would be. Even with the strong British Pound lining our pockets, the U.S. was much pricier than we thought. By far our most expensive country so far, we spent a mind-boggling $8,333.00 /£5,530.60 in those 70 days. Major expenses within this figure include both our flights from London to Las Vegas and L.A. to Mexico, plus an Enterprise rental car which we had for two months. Excluding these numbers, our actual daily spend was $4,628/£3,071.60, or roughly $1,356/£900 per person per month. Transportation: Our trusty Chevy Aveo rental ran us $1700 / £1,128 (including optional $560 insurance), which averaged out to $28.33 / £18.80 per day. 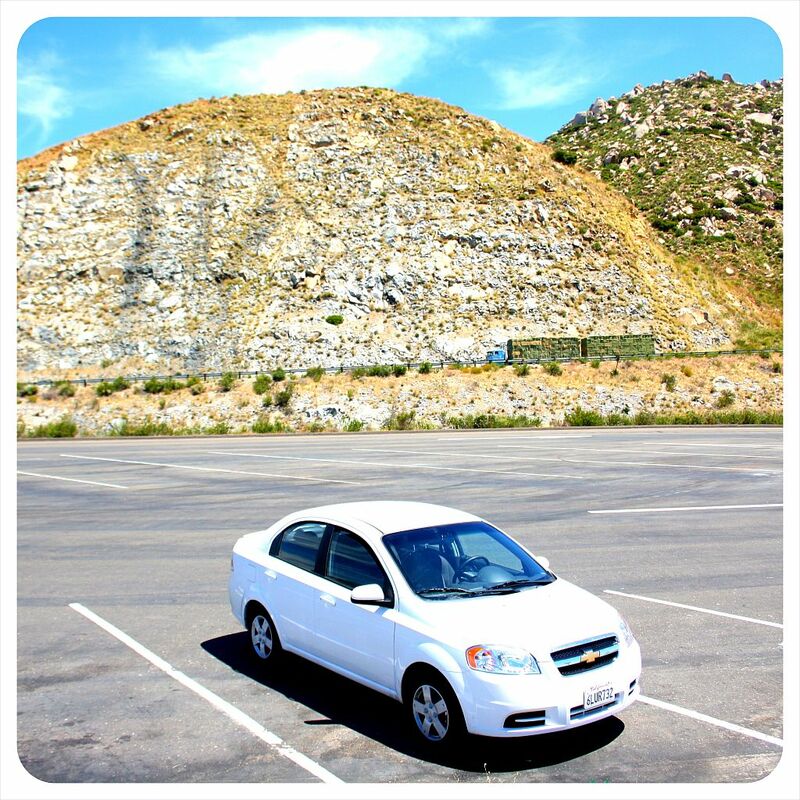 At first glance (and second, and third) it might seem a luxury, but without the car, we could never have explored the South West, or drive the classic Pacific Coast Highway from L.A. to San Francisco as well as from San Diego to Tucson, making this a totally necessary expense. We drove 5200 miles, and of course the cost of gas and parking fees also added up to be quite expensive. Accommodation: During the times we were not reviewing hotels or doing long-term housesits, we paid a higher price for accommodation than we originally expected, as many places that we visited did not have hostels. Dusty roadside motels were cheap ($29 – $39 / £18 – 25), while city center digs ran us upwards of $69. We paid a ridiculous $119 for a tent cabin (!) in Big Sur, and a last minute Holiday Inn Express was $109 in the three-hotel, no-vacancy town of Chinle where we holed up for the night during our visit to Canyon de Chelly in northern Arizona. Average accommodation per night based on two sharing: $45/£29. Tip: Accommodation costs might be higher in the US than in Latin America, but there are also incredible deals to be found online which are much harder to come by in the less deal-savvy neighbors to the south. Websites such as booking.com or lastminute.com allowed us to score excellent rates on hotels than just showing up ever did. On a few rare occasions we were able to negotiate a better rate on site. Food: The occasional treat aside, our restaurant choices were of the roadside variety, cheap diners, fast food and the like. The average meal at a cheap diner cost around $25 for both of us. While house-sitting we were able to shop at the grocery store, spending an average of $100 per week during our two house sits. Regardless of the relatively high costs of exploring the southwestern United States, we managed to do both Los Angeles and San Francisco on a shoestring and kept our spending lower by including house-sits and visiting friends. Average per day per person: $45/£30 (including car). Our spending dropped significantly once we crossed the border into Mexico – in total we spent $3622.26/£2367.78 in 88 days. 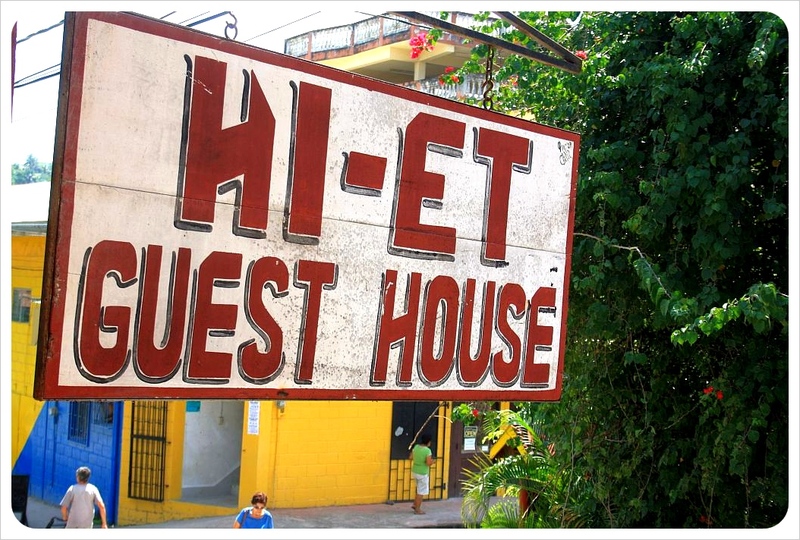 Accommodation: In Mexico, we stayed in mix of hostels and budget hotels. 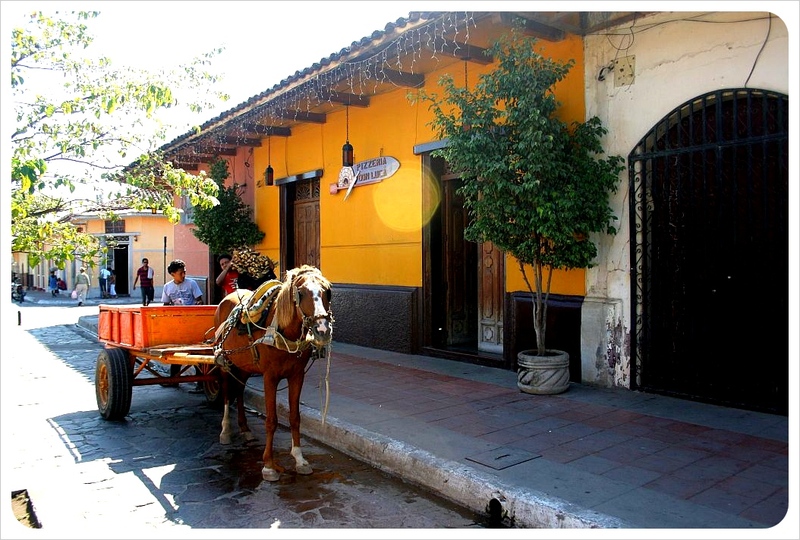 The cheapest accommodation cost $12/£8 for both of us at one of our favorite places– La Candelaria in Valladolid. 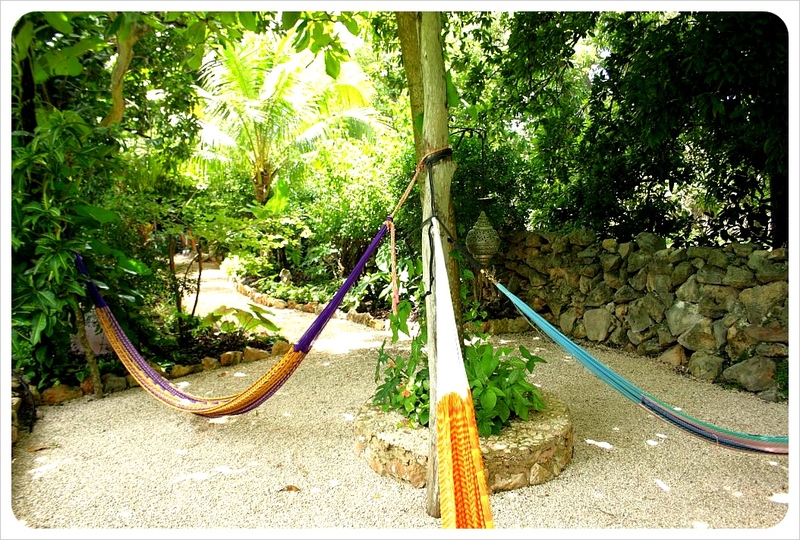 The most expensive room at Posada Ziga in Mazunte was $35 /£23. Average accommodation per night based on two sharing: $21/£15. Food: Our meals in Mexico cost around $12/£8 for dinner for two, and breakfast for about $10.50/£6.90 for two people. As anyone who reads us often will know, however, inexpensive (and delicious!) street food was our main meal of choice and we rarely ate in restaurants. 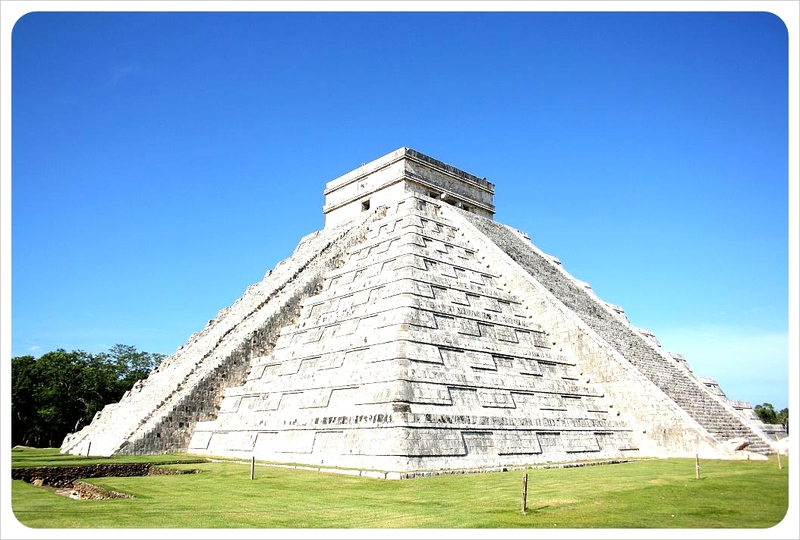 Culture: Mexico is teeming with cultural options and we visited everything from museums to galleries to both Maya and Aztec ruins. The ruins all have a set price of 51 Pesos, or $3.95/£2.55 per person, with one exception: Chichen Itza, which costs around $14/£9 per person. Transportation: Long haul bus travel in Mexico is much nicer, but also much more expensive than in Central America. You travel in relative style, but you pay for it. The most expensive overnight bus rides tend to cost around $31/£21 per person. The cheapest long-haul trips cost us each $8.50/£5. On average we paid $10/ £6.70 per person. We already knew through the grapevine that Belize was going to be more expensive than the rest of Central America (Lonely Planet suggests US$40 – $60 per day), but we were still surprised that costs were as high as they are for such a sparsely populated and economically struggling country like Belize (read our tips for Belize on a shoestring here). Accommodation: We stayed in fairly basic accommodation in Belize, no bells or whistles, but always private rooms. The average cost was US$22.50/£14.20 for a double en-suite room. Transportation: This is one low cost area for travelers in Belize. Chicken buses, which appear to be held together by masking tape and a lot of luck, cost next to nothing for long distance travel in Belize. A two hour bus ride from Belize City to San Ignacio, nearly completely cross country, costs only $3.50/£2.21 per person. Speed boats between the Cayes in the Caribbean costs about $10/£6.32 to go between them, and golf cart rental on Ambergris Caye costs around $35/£22.10 per day. Food: Meals in a restaurant both on the Cayes and in San Ignacio cost around $20/£12.60 for two, including a beer or two here and there. Belize is not that big on street food, so sitting down and ordering is a must for your main meals of the day. 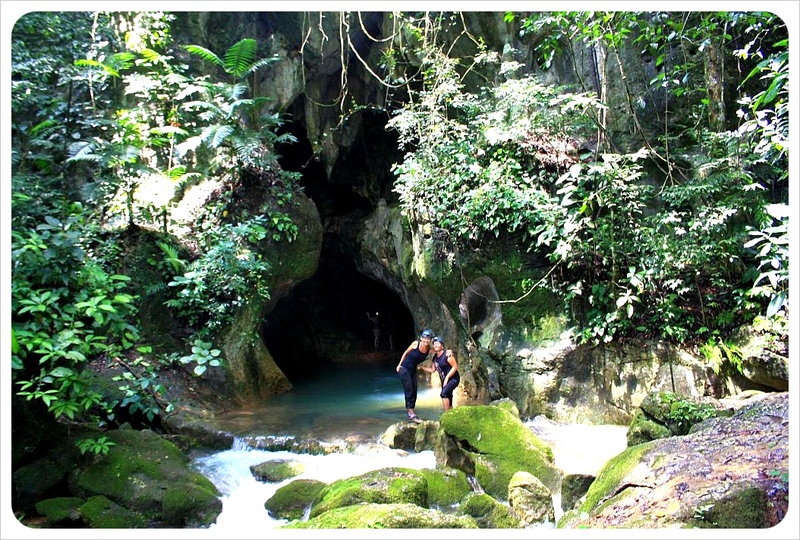 Adventure: We took advantage many of the adventurous activities available to visitors in Belize. Snorkeling with Harry and Steve (recommended, just ask around) on Caye Caulker cost US$40/£25.25 each for a full day, or US$20/£12.63. The ATM cave tour was $65 each (discounted). 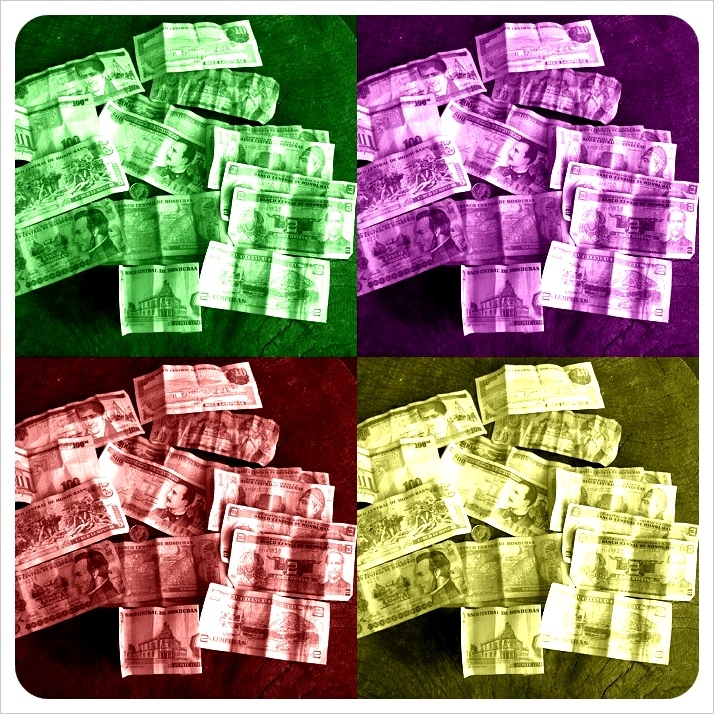 All of our fun over 11 days totals $348/£200. Crossing the border into Guatemala after our expensive stay in Belize felt good, and our expenses have been much less here. Accommodation: On average, we spend $18.43/£11.65 per night for a double room including breakfast. Dorms are cheaper for single travelers, but for anyone traveling with a partner, private rooms only run about Q10 or $1.25 more. 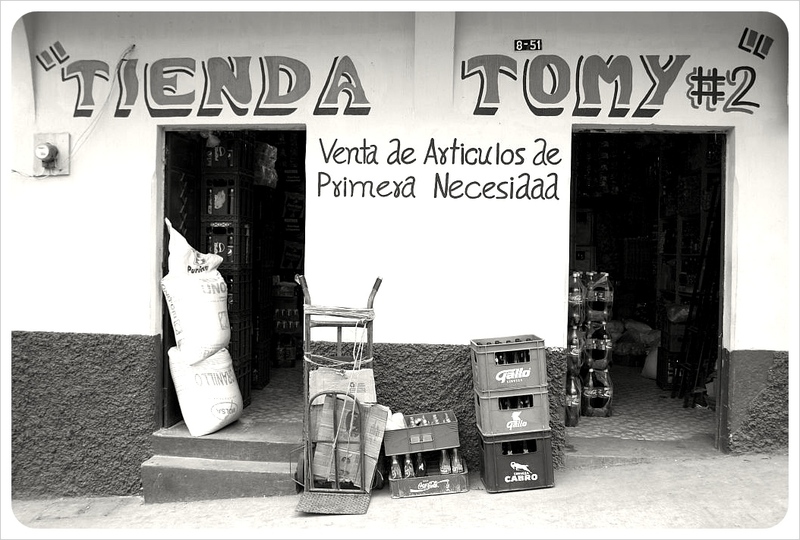 Transportation: Take a chicken bus, and this will be your cheapest expense in Guatemala. Long-distance bus travel by chicken bus costs around $4.00/£2.55 per person – the more comfortable 1st and 2nd class coaches are considerably more expensive – the overnight bus we took from Flores to Antigua was $29.50/£19.50 per person. Food: You can eat like a king in Guatemala and easily stay on budget. A decent meal for two in a restaurant costs around $10/£6.60, though in Antigua, depending on the restaurant, this average can more than double. Tikal: The highest expense in Guatemala was our trip to Tikal, which was around $66/£42.00 for both of us. This does not include accommodation in Flores, but does include the shuttle service to Tikal, the guide and entry fees. On average, we have been spending $27.50/£17.58 per person per day, which might seem a bit high to some, but includes pricey medication for Dengue and Giardia, neither of which was cheap. In total, we spent around US$14,720/£9,646 for the two of us in 6 months, which includes all flights and public transportation, and more than two months in the U.S. We hope our next budget post in 6 months will be much less, with no major flights, hopefully a few more house-sits, and lower expenses in South America than we had for the first 70 days in the United States. We showed you ours… now you show us yours! We would love to hear about your budgets and expenses in the comments below to see how our spending compares with that of backpackers and digital nomads. If you have tips on great deals, cheap but quality accommodation in the US, Mexico, Central America or South America, or other ways to save money, please do share as well! Any trip to Belize is sure to include a stay on Ambergris Caye and/or Caye Caulker, both a part of the Northern Cayes, or islands, of Belize. Although only a twenty minute boat ride separates them, these two Cayes are worlds apart in terms of the travel experience available on each island. For long-term travelers, backpackers or digital nomads, a trip through Belize on a tight budget can be a challenge and a choice might need to be made about which Caye to choose if a visit to both is impractical for budget or time purposes. Read on for a summary of the two Cayes to help decide which of these two strikingly different Cayes might be more your style. Ambergris Caye, population 10,500, is the larger of the two islands by far and is much more developed than Caye Caulker. Also referred to as San Pedro, Ambergris Caye is more upscale than Caye Caulker – not only are there more than 50 hotels on the islands, there are also dozens of new condominium buildings which serve as retirement homes for American expats. 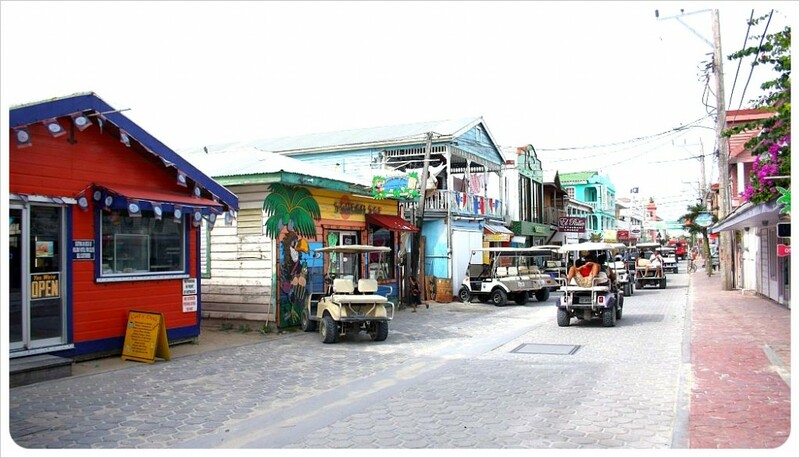 The roads are paved and the island is big enough to use golf karts as their main means of transport, in such numbers that they can even cause traffic jams in San Pedro. There are several supermarkets in San Pedro including the large Island Supermarket, which, with its (overpriced) food and drink from the States, caters mainly to the American expat population. The main reason that people visit is to go on diving or snorkeling trips, as the Mesoamerican reef is only half a mile from the West side of the island. 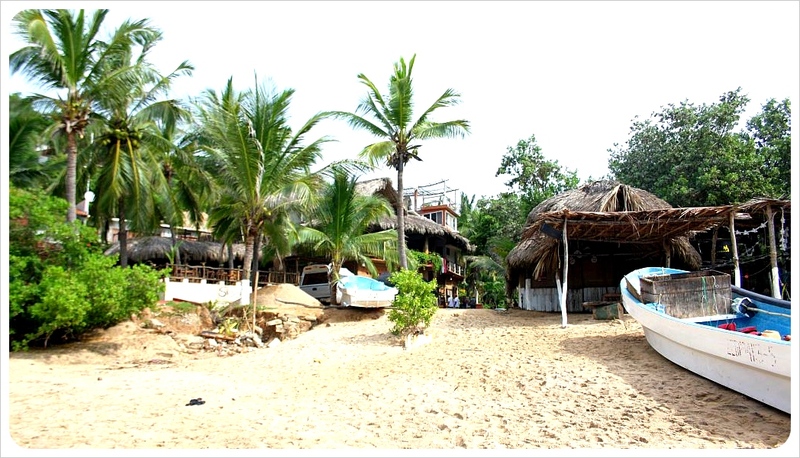 There are beaches around San Pedro stretching along further south, and the town has several beach side restaurants. We found that the tourists on Ambergris Caye were older and mainly American; there were hardly any backpackers – which might be due to the higher prices on the island (in comparison to Caye Caulker) for both accommodation and food. 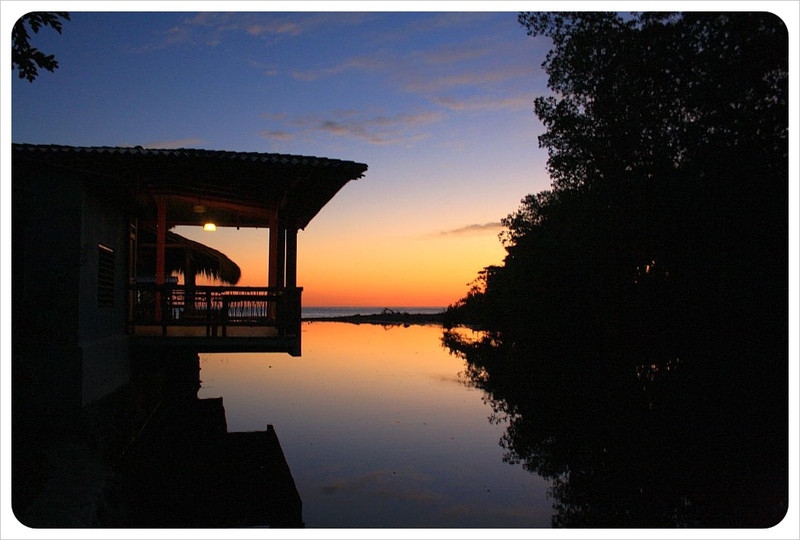 Caye Caulker is considerably smaller than Ambergris Caye, with a population of just 1,300. It has always been the backpacker destination of the Cayes, but the number of more expensive hotels is growing, including the brand new Caye Caulker Plaza. There is still plenty of budget accommodation, including one hostel – Yuma’s House, formerly Tina’s Backpackers. 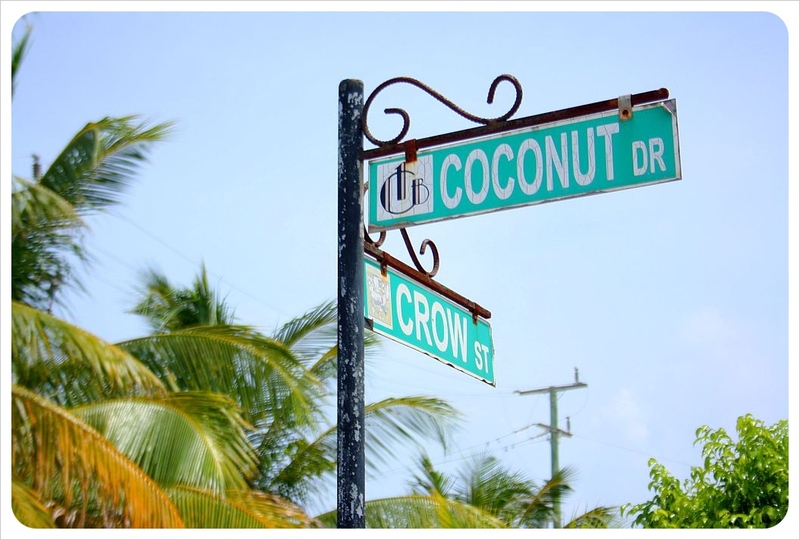 Restaurants and hotels are cheaper than on Ambergris Caye though, and the feel of Caye Caulker is much more laid back – ‘Go Slow’ is not without reason the island’s motto. Whereas San Pedro is busy with the whizzing of golf carts, on Caye Caulker most people are out and about on foot or bicycle. The three unpaved roads are aptly named Front Street, Middle Street and Back Street. Front Street is on the west side of Caye Caulker where the ferries arrive and where most of the hotels and restaurants are located. 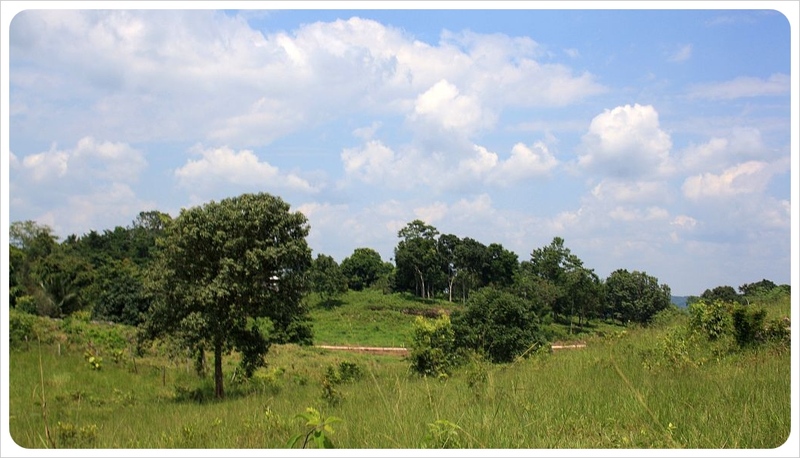 The village measures not even one kilometer north to south, you can explore it in its entirety on a two hour walk. Not surprisingly, infrastructure is limited, leaving tourists with very little choice. The lack of a swimming beach (lots of seagrass, no beachfront chill spots), leaves visitors the option of sunbathing and swimming at the Split on the north side of Caye Caulker, where a hurricane literally split the island in two. 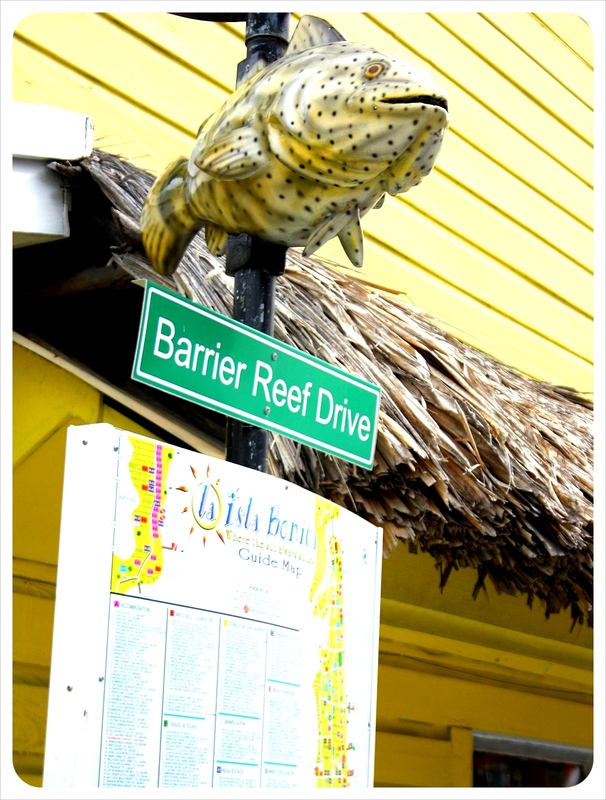 The best thing to do on Caye Caulker is snorkeling or diving – there are various tour operators that offer boat trips to the Reef where snorkeling is excellent. Snokerling is fine, no need to dive really, as the water is very shallow). 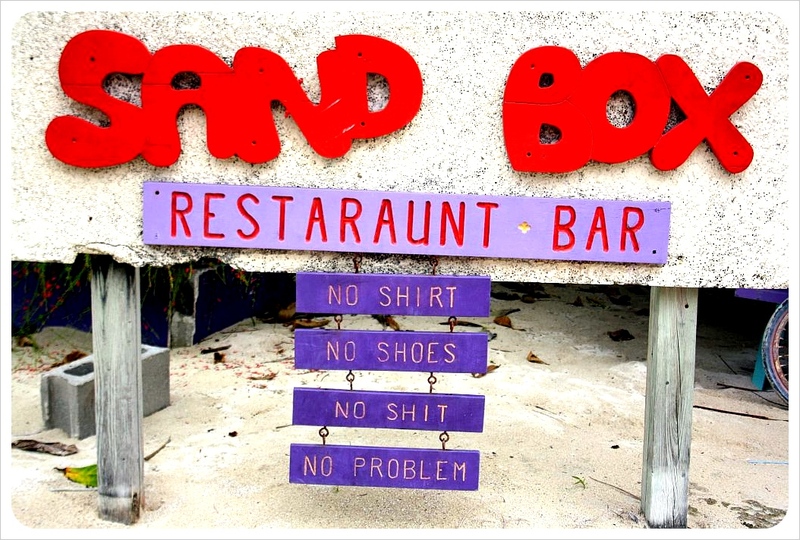 Lonely Planet has more restaurant suggestions for Caye Caulker, and a full list of accommodation can be found here. 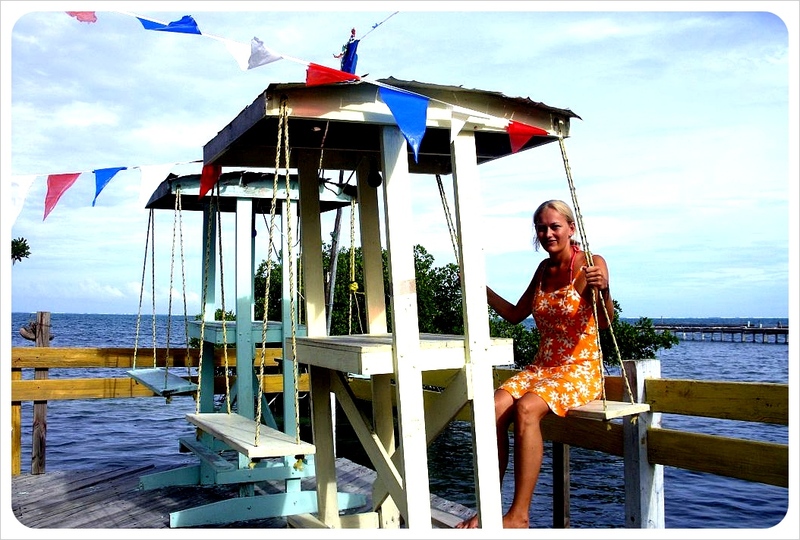 We enjoyed Caye Caulker much more than Ambergris Caye. 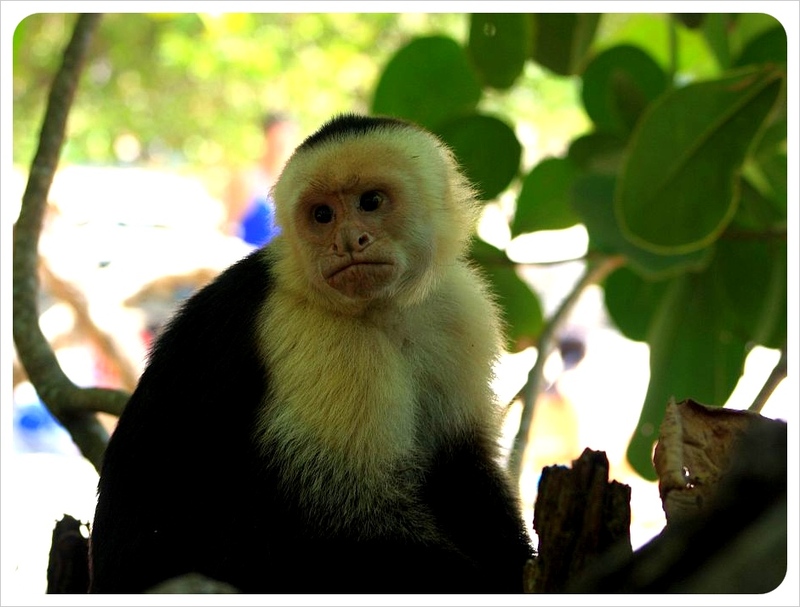 While Ambergris Caye was mainly filled with American expats and tourists, Caye Caulker attracted a much younger, more laid-back kind of traveler. 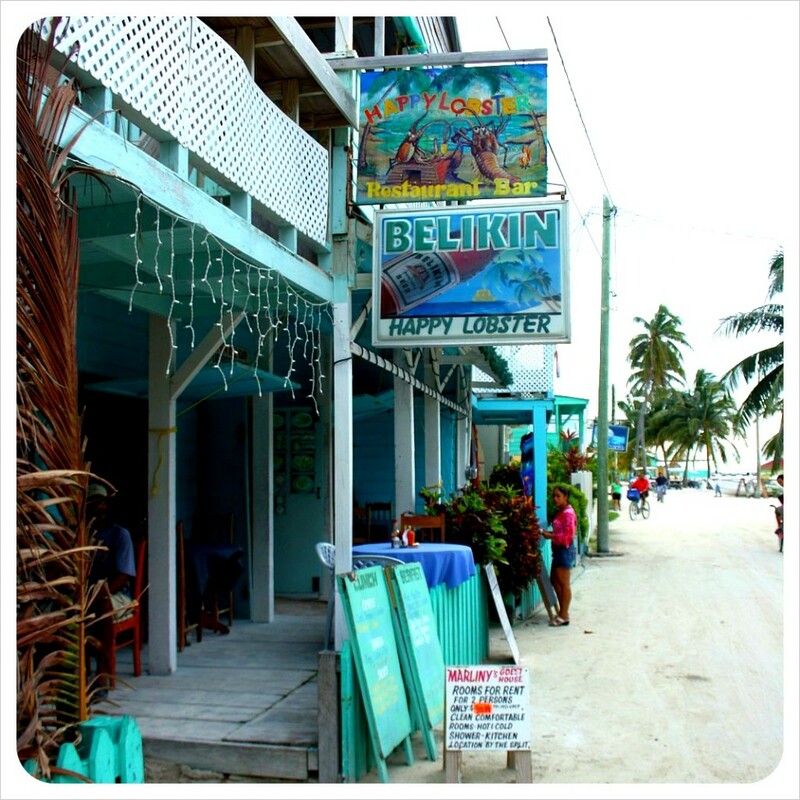 It is on Caye Caulker where you meet other backpackers and because the island is so small, you meet people quickly as you continue to bump into each other frequently strolling up and down Front Street or in one of the restaurants. The locals are also much friendlier, starting a conversation with you and living the ‘go slow’ lifestyle and telling you: “Smile, you’re on vacation”. The Marine Terminal in Belize City has ferries running to both islands every 30 minutes. 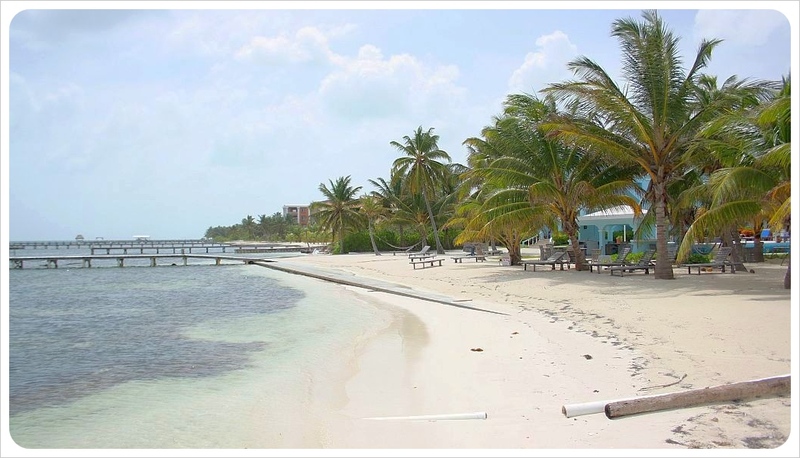 Ambergris Caye has a small airport which is served by Tropic Airline and has hourly flights from Belize City.